Checked suits: Done right, modern check suiting has a vintage elegance to it that is both contemporary and traditional. Done wrong, it looks like you raided your grandfather's closet. There is no matter if the checks are small or wide, you will be trendy. y to add interest and vivacity to a traditionally bland menswear colour palette. The floral prints are used last years and they are really appreciated that's why they are still the most wanted prints in suits. The abstract prints are also wanted and most of the sartotial brands bet on them. Metallic suits: metallic colours conquer the catwalks. The gold and the silver are of the mandatory colours in the Fall/Winter 2018-2019 palette. These suits are really attractive and stylish. 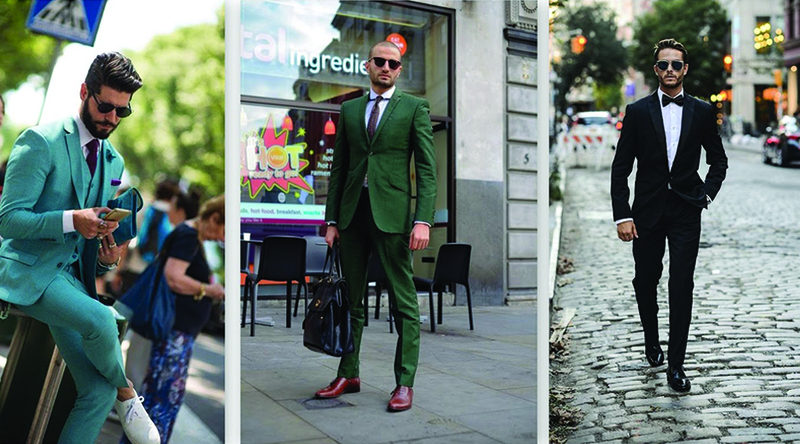 Velvet suits: the velvet - this fabric is still one of the most wanted. The velvet suit is suitable for every formal event. The designers combine the velvet jacket with satin revers for better look. Double-breasted suits: A double-breasted suit is one to always keep on hand for formal and business occasions. With its two columns of detailed buttons, it creates a sophisticated exterior to match that of the event. The wider panels of the suit overlap in order to fit neatly across one another. As the double-breasted suit should be worn while buttoned, it contributes to the overall polished look that the suit provides. Coming in a multitude of styles, colours, and fits, you can determine the statement that you want to make when rocking your jacket. Whether that be deciding upon a slim fit double-breasted blazer in plaid or in navy, you are in control of the statement you wish to present.